W. A. Martin Elementary or Hollis T. Dietz Elementary. 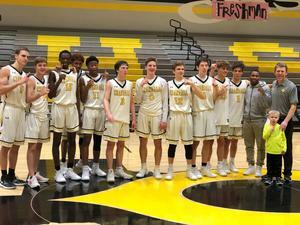 Congratulations to the Varsity Boys Basketball team on clinching the district championship and the number 1 seed last night with a 62-54 win over Sunnyvale. Our Pirates are back to back district champs and have an 8-0 district record with a 22-10 record overall. See flyer for required documentation and locations. 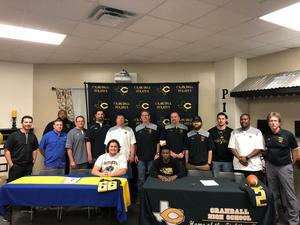 Two Crandall Pirates signed their national letters of intent on Wednesday, February 6, 2019. Senior Coty Neugin will be playing football at Southeastern Oklahoma University in the fall of 2019. Senior Doneric Rivers will be playing football at Northwestern Oklahoma University in the fall of 2019. Congratulations to these two hardworking young men. Go, Pirates! Press Release regarding Dr. Jolly's retirement. Dr. Robert Jolly will be retiring in June after 7 years with Crandall ISD.